"The Babylon Project was our last, best hope for peace. A self-contained world five miles long, located in neutral territory. A place of commerce and diplomacy for a quarter of a million humans and aliens. A shining beacon in space, all alone in the night. It was the dawn of the Third Age of Mankind...the year the Great War came upon us all. This is the story of the last of the Babylon stations. The year is 2259. The name of the place is Babylon 5." Babylon 5 is what boxed sets should be all about, an epic storyline featuring the forces of light and darkness. Babylon is the highly popular science fiction series that featured some of the most realistic stories and special effects to have ever graced the small screen. The story picks up right after the dramatic conclusion of season one with a new captain taking over Babylon 5, the charismatic John Sheridan who is played by Bruce Boxleitner. After the shocking events of season one, former captain of Babylon 5, Jeffery Sinclair has been called away on a highly classified mission to the Minbari homeworld. Unfortunately for Babylon 5, the gigantic space nation is need of a captain and only one man is suited for the position. Babylon 5 is created by esteemed writer, J. Michael Straczynski who is known worldwide for his intriguing storytelling. Babylon 5 is an Earth run space station that is located near the boarderworlds in neutral territory. The ideal of Babylon 5 is a place of commerce and diplomacy between the myriad of species that exist in the universe. Unfortunately for the denizens of Babylon 5, an ancient dark evil has returned and not only threatens everyone onboard this space station but also the very universe itself, military hero John Sheridan. The majority of episodes of Babylon 5 are self contained episodes that are all part of its continuity, many episodes giving away vital clues to upcoming storylines and the fate of the crew of Babylon 5. The cast of Babylon 5 is varied and includes Captain John Sheridan (Bruce Boxleitner), the gorgeous yet intelligent Commander Susan Ivanova (Claudia Christian), the peace loving Minbari Ambassador Delenn, the rough and cocky Chief of security Garibaldi (Jerry Doyle) and a variety of other alien creatures such as the mysterious Ambassador Kosh and former warrior, Ambassador G'Kar of the Narn. Although season 2 starts off slowly, it soon builds to a shocking crescendo that reveals the truth about Kosh and the discovery of an upcoming war between light and darkness. Other key episodes explain the truth behind Earth's PSI-corp, the explanation of the death of Anna Sheridan, Captain Sheridan's wife and a biblical discovery that rocks the foundations of B5. The video transfer quality of Babylon 5 is a mixed bag of good but unfortunately mostly bad. There is a very minimal amount of artefacting but unfortunately the majority of the episodes feature quite a bit of graininess throughout the six DVD's. The strange thing is, one scene is perfect but when they swap back to another character, the picture quality goes grainy again. 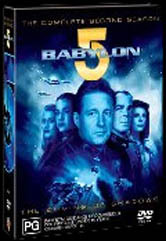 You can however forgive Fox for the poor video transfer due to the age of this television series but fortunately for DVD viewers, Babylon was originally filmed in 16:9 widescreen, so viewers can once again view the joy that was Babylon 5. The audio transfer of Babylon 5 to DVD is perfect and features some great use of Dolby Digital 2.0 surround sound. The special effects and soundtrack all make use of the Dolby Digital capabilities that sounds remarkable. Babylon 5 is littered with extras that can found all over in the boxed set. Some of the special features include commentary by the shows creator J. Michael Straczynski, cast commentary by Bruce Boxleitner, Claudia Christian and Jerry Doyle that is some of the best commentary that I have ever heard and a variety of other special features that includes two informative featurettes, personnel files, historical timelines, some awesome gag reels and original episode previews. Babylon 5 easily deserves a ten out of ten for specials. In conclusion Babylon 5 is easily one of my favourite science fiction shows of all time that features some amazing storytelling that not only puts Star Trek to shame but almost every other science fiction show on television. The acting, special effects (although dated now), the awesome soundtrack all comes together perfectly making Babylon 5 the perfect addition to any science fiction fans collection. Highly Recommended!